For centuries, merchants have traveled all over the world, bringing back exotic goods to their homelands. You can think of the recently opened Homme, a new shop on Polk Street near Union Street, as a modern-day outpost for antiques, vintage furnishings and one-of-a-kind pieces. Opened this winter by interior designer Michelle Homme, the shop is a reflection of her globetrotting past mixed with her California roots, bringing in designs from all over the world, and our own backyard. Having spent over 15 years in the design community, Michelle has developed valuable relationships with vendors, manufacturers, craftsmen, and designers throughout California, New York, Europe, and Asia. 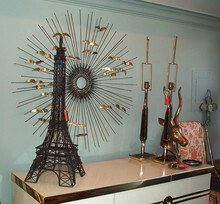 She now brings unique items she procures through them to her store in Russian Hill. Michelle first began to cultivate her creative conceptual skills during while working at Tucker & Marks, a San Francisco high-end interior design firm, as an undergraduate studying literature at U.C. Berkeley. 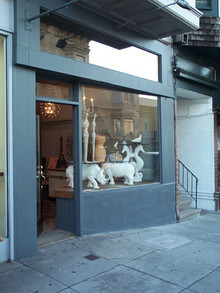 Throughout the years, she picked up an appreciation for various artistic and decorative channels as she crisscrossed the globe working and learning: studying the decorative arts at Christie’s auction house in London, working for San Francisco interior designer Edward Lobrano, overseeing set decoration on independent films, designing accessories for a home furnishings company, freelancing as an interior designer, and more. The essence of her life’s journeys are now distilled into the shop. The California side of Homme’s aesthetic leans toward the stark and sparse southern part of our state — think a swanky 60s-era spread in Palm Springs or a coastal dwelling in Hermosa Beach. 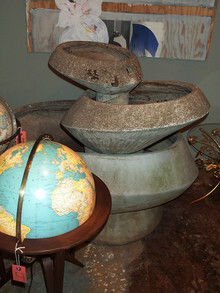 It is combined with artwork and antiques from around the world, often in near mint condition. You’ll find postcard-size photos of Tahoe winter scenes on wood block prints from San Francisco artist Lisa Coris ($30), shot-up propane tank chandeliers/ceiling pendants from the Mojave Dessert ($800), bars of Big Sur Country Soap in cherry oat poppy scrub, sea kelp or vanilla cinnamon scents ($8), and a mid-to-late last century cast-concrete fountain by San Leandro’s Lucchesi Art Stone ($4,200). On my visit I also saw 1960 Dansk Carafes ($130), a large late-1800s/early-1900s French oil painting on canvas of woman in a classic Greek style ($750), a 1949 lighted Rand McNally globe designed by mid-century modern designer Edward Wormley ($2,250), a 1950s Widdicomb Arts & Crafts modern side table designed by famed woodworker George Nakashima ($6,450), and a set of seven brass candle holders and photographs, like the one titled “Caravan,” from British-born Jason Florio ($700). Though the small space doesn’t feel crammed, it does have a surprising number of hanging lamps. In addition to the propane tanks, there was a “dome of reeds” ($550), an Italian 1920s gilded-metal chandelier with blue glass beads ($2,450), and a brand new chrome Sputnik pendant lamp produced by a designer in Los Angeles ($700). In addition to the store, you can visit the Homme’s website on 1stdibs to peruse the inventory online, though you’ll miss getting to visit with Michelle and her dog Maggie May.